A newly operational radio telescope in Australia has successfully demonstrated that it can track orbiting space debris by listening in to reflected signals from terrestrial FM stations. 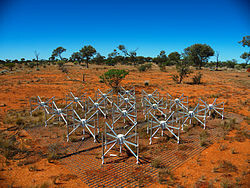 This research project headed by Curtin University in Western Australia uses the Murchison Widefield Array (MWA), one of three precursor telescopes making up the 2 billion dollar Square Kilometer Array project. The study has already been successful in picking up signals from FM stations in Perth and Geraldton reflected back to Earth by the international space station as it passed over Western Australia approximately 500 Km above the Earth’s surface. Team leader Professor Steven Tingay said "We have shown that we can detect approximately 10 pieces of space junk simultaneously. Over time this means we are in a position to monitor a significant fraction of the junk orbiting Earth". The importance of this is that space debris is unpredictable and poses a significant collision risk to expensive space infrastructure, such as communication satellites. He went on to say that "An early warning system has the potential to protect the billions of dollars' worth of vital infrastructure orbiting Earth and has the potential to prevent collisions that generate even more space debris, such as the incident with the Iridium 33 satellite in 2009".